For enhanced safety, the front and rear seat shoulder belts of the Mercedes C-Class Sedan have pretensioners to tighten the seatbelts and eliminate dangerous slack in the event of a collision and force limiters to limit the pressure the belts will exert on the passengers. The BMW 3 Series Sedan doesn’t offer pretensioners for the rear seat belts. For enhanced safety, the front and rear seat shoulder belts of the Mercedes C-Class Sedan are height-adjustable to accommodate a wide variety of driver and passenger heights. A better fit can prevent injuries and the increased comfort also encourages passengers to buckle up. The BMW 3 Series Sedan doesn’t offer height-adjustable seat belts. The C-Class Sedan offers optional PRE-SAFE Brake, which use forward mounted sensors to warn the driver of a possible collision ahead. If the driver doesn’t react and the system determines a collision is imminent, it automatically applies the brakes at full-force in order to reduce the force of the crash or avoid it altogether. The 3 Series Sedan offers an available collision warning system without the automated brake feature which would prevent or reduce the collision if the driver fails to react. The C-Class Sedan’s driver alert monitor detects an inattentive driver then sounds a warning and suggests a break. According to the NHTSA, drivers who fall asleep cause about 100,000 crashes and 1500 deaths a year. The 3 Series Sedan doesn’t offer a driver alert monitor. Both the C-Class Sedan and the 3 Series Sedan have standard driver and passenger frontal airbags, front side-impact airbags, driver knee airbags, side-impact head airbags, plastic fuel tanks, traction control and electronic stability systems to prevent skidding. A reliable vehicle saves its owner time, money and trouble. Nobody wants to be stranded or have to be without their vehicle while it’s being repaired. 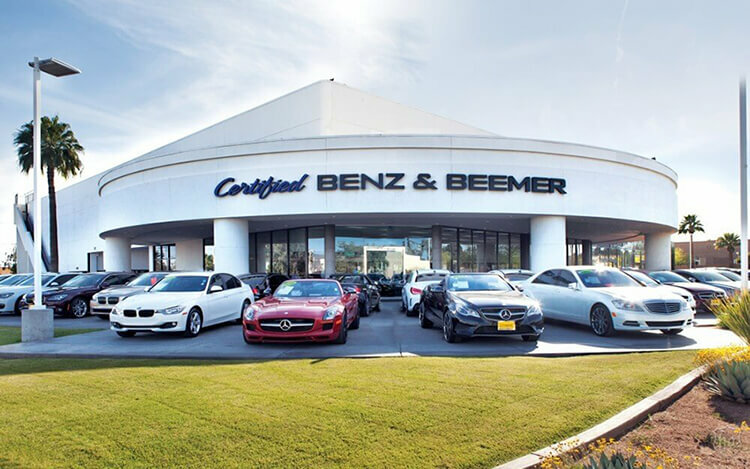 Consumer Reports predicts that the Mercedes C350 Sedan’s reliability will be 75% better than the BMW 3 Series Sedan 335i and the Mercedes C250 Sedan is 35% better than the BMW 3 Series Sedan 328i. 320i 2.0 turbo 4 cyl. 328i 2.0 turbo 4 cyl. 335i 3.0 turbo 6 cyl. The C-Class Sedan has 2.4 gallons more fuel capacity than the 3 Series Sedan ActiveHybrid/diesel’s standard fuel tank (17.4 vs. 15 gallons), for longer range between fill-ups. The C-Class Sedan has 1.6 gallons more fuel capacity than the 3 Series Sedan’s standard fuel tank (17.4 vs. 15.8 gallons). The C-Class Sedan Luxury’s standard tires provide better handling because they have a lower 45 series profile (height to width ratio) that provides a stiffer sidewall than the 3 Series Sedan’s standard 50 series tires. The C250 Sedan handles at .91 G’s, while the 335i pulls only .87 G’s of cornering force in a Road & Track skidpad test. The C250 Sedan goes through Road & Track’s slalom 2 MPH faster than the 328i (69.1 vs. 67.1 MPH). For better maneuverability, the C-Class Sedan’s turning circle is 1.8 feet tighter than the 3 Series Sedan’s (35.3 feet vs. 37.1 feet). The design of the Mercedes C-Class Sedan amounts to more than styling. The C-Class Sedan has an aerodynamic coefficient of drag of .27 Cd. That is lower than the 3 Series Sedan (.29 to .3) and many sports cars. A more efficient exterior helps keep the interior quieter and helps the C-Class Sedan get better fuel mileage. As tested by Road & Track while under full throttle, the interior of the C250 Sedan is quieter than the 328i (73 vs. 75 dB). Unlike the driver-only memory system optional in the 3 Series Sedan, the C-Class Sedan offers an optional driver and passenger memory, so that when drivers switch, the memory setting adjusts the driver’s seat, steering wheel position and outside mirror angle and the front passenger seat also adjusts to the new passenger’s preset preferences. The C-Class Sedan’s optional easy entry system raises the steering wheel when the door is unlocked or the ignition is switched off, making it easier for the driver to get in and out. The 3 Series Sedan doesn’t offer an easy entry system. To shield the driver and front passenger’s vision over a larger portion of the windshield and side windows, the C-Class Sedan has standard extendable sun visors. The 3 Series Sedan doesn’t offer extendable visors. According to The Car Book by Jack Gillis, the C-Class Sedan is less expensive to operate than the 3 Series Sedan because typical repairs cost less on the C-Class Sedan than the 3 Series Sedan, including $53 less for front brake pads and $174 less for a timing belt/chain. Motor Trend performed a comparison test in its February 2013 issue and they ranked the Mercedes C350 Sedan higher than the BMW 335i.